Adventures in the Endless Pursuit of Entertainment: "A Sondheim birithday celebration is a celebration for all of us"
"A Sondheim birithday celebration is a celebration for all of us"
At City Center's Sondheim Birthday Gala, hostess Mia Farrow said, "A Sondheim birthday celebration is a celebration for all of us." Yes it is. Even when you've just run from work in pouring rain without proper footwear, you're sitting far back in the cave of the rear mezzanine with some very grumpy people and you've got to go back to work. Any Sondheim, but especially a Sondheim Celebration, is a sparkling respite from all that is out tough and miserable in the world. Actors from original and revival productions of Stephen Sondheim's work gathered to reprise their roles - and in some cases their current role. The most thrilling moments for me were: Donna Murphy, from the original production of Passion, singing Fosca's Letter and Loving you from Passion, Joanna Gleason, from the original production of Into the Woods, singing Moments in the Woods, Maria Friedman, from the original London production of Sunday in the Park with George, singing Children and Art, Jim Walton, from the original production of Merrily We Roll Along, singing Our Time. Maria Friedman, who has been in a number of Sondheim shows in the West End and named him as the Godfather to her son, was a surprise. She beat the volcanic cloud to get here and thank goodness - the last few bars of her Broadway Baby are worth the money. It was exciting to hear the audience so enthusiastic for various artists, demanding encore bows from Raul Esparza, Len Cariou, Michael Cerveris, Catherine Zeta-Jones, and Nathan Lane. When Angela Lansbury, looking resplendit in silver satin, took the stage, the audience jumped to its feet in thunderous ovation before she had even sung a note and it may have been her best Liaisons yet. Well, I guess that it's for this season's Sondheim Birthday Celebrations...at least in New York. The NSO Pops is presenting three nights at the Kennedy Center May 6-8th, Ravinia takes its turn on July 31st . That same night, across the pond, BBC Proms celebrates and will broadcast it both on the radio and the tele. 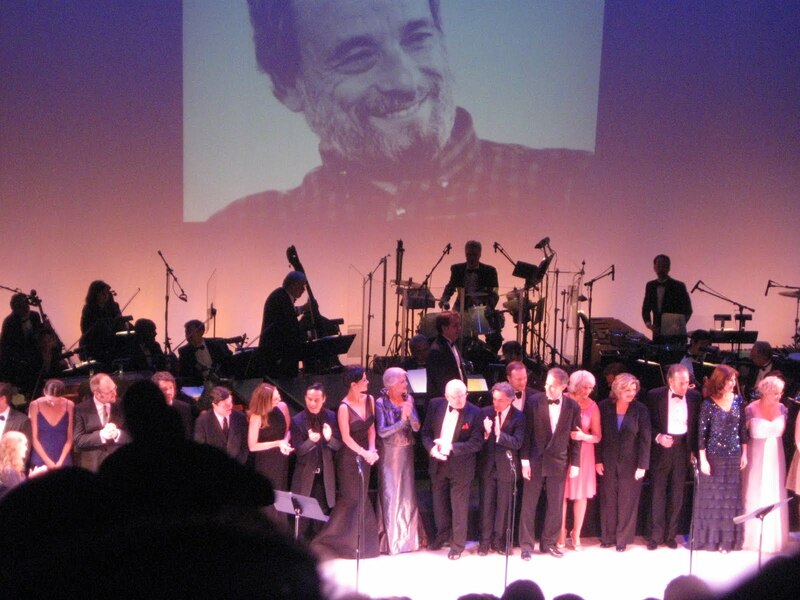 So, thank you Mr. Sondheim for turning eighty and giving a celebration to all of us. Oh I wish they would record these moments in theatrical history for all us outlanders. A DVD would be nice. A CD would be sweet. I can only hope! Thanks for the coverage, SB, you always give your intimate personal touch. Lovely coverage! And lovely Angela is lovely in the lovely silver gown! I would have loved to have seen her singing the lovely "Liaisons."